On Saturday, March 12, 2011, Vince Razionale from Jasper Hill Farms spoke about the unique model that entrepreneurs and farm owners Andy and Mateo Kehler have developed to support the farmstead and cheese-making culture in northern Vermont. The brothers bought Jasper Hill Farm in 1998 and began the hands-on learning process of farming and cheese making. In 2004 their efforts paid off when a NY Times article catapulted their small business into the news. Around that time, they were approached by Cabot Creamery to first age, then distribute, a niche market cloth bound cheddar. As success with this single product grew, the Kehler brothers saw a business opportunity that would revitalize the small dairy farm industry in northern Vermont. Working with Cabot, the brothers built a 22,000 square foot cheese aging facility with seven “vaults” or cellars to separate and house different varieties of cheeses. The award winning Cabot Clothbound cheddar currently occupies two of these vaults and other area farmers are able to sell their cheeses to the “Cellars at Jasper Hill” (a separate entity from the Jasper Hill Farm cheese making business) to be aged and distributed. While all the cheeses are co-branded with the producing farm, the Cellars at Jasper Hill takes responsibility for marketing, distribution, and customer relations. This model makes it economically viable for small dairy farms to diversify by producing quality cheeses that can be aged and brought to market centrally. Vince noted that farmers can realize as much as five times the value on their cheese product as on their milk, which makes it much more likely that the farm will continue to operate. The Cellars at Jasper Hill currently has seven artisan partners that they represent. 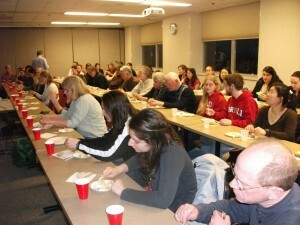 The discussion and tasting was co-sponsored with the Cheese Club at Cornell.